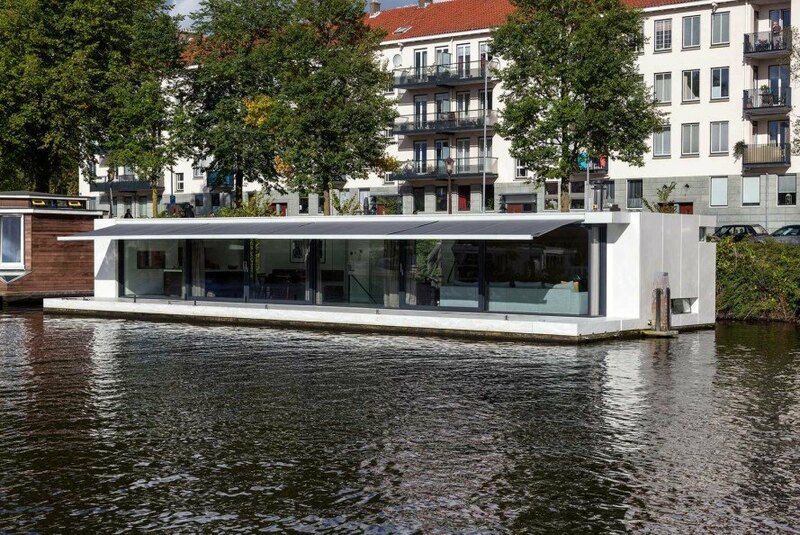 +31 Architects’ latest houseboat floats very close to an earlier project from the studio, the Watervilla De Omval. Its sliding floor-to-ceiling doors open to a moored floating terrace of the same width, while three sun awnings on its flat roof filter excess light. Inside, the pale grey flooring of the living room area extends onto the terrace, merging interiors and exteriors. Floating steps provide access to the open-plan windowless basement, where two bedrooms and bathrooms and a small lounge are located. The floating house is connected to the quay via a wooden bridge, which flexes as the residence rises and falls with the tide. The unique house’s number display was created with a perforated aluminum sheeting with LEDs behind that glow only during the night. +31 Architects' latest houseboat floats very close to an earlier project from the studio. Its sliding floor-to-ceiling doors open out to a moored floating terrace of the same width. The pale grey flooring of the living room and terrace merge the interiors and exteriors. Floating steps provide access to the open-plan windowless basement. The house is connected to the quay via a wooden bridge. The house's number display was created with a perforated aluminum sheeting with LEDs.